The Nokia 9 PureView was announced back in February but it’s only now, on March 26, that you can buy the phone in the UK. If you’re reading this it should be available to buy right now, coming in at £549 and being sold by Argos, Amazon, Mobile Phones Direct, Buymobiles.net, very.co.uk and littlewoods.com. Grab the Nokia 9 PureView by April 18 and you’ll also get a free pair of Nokia True Wireless Earbuds thrown in. At £549 it substantially undercuts most flagships, yet the Nokia 9 PureView has its share of high-end features, the highlight of which is its five-lens rear camera, a spec which no other phone currently has. The five 12MP sensors all work together to capture up to 10 times as much light as a single lens of the same type, allowing the final image to hold between 60MP and 240MP of data. The Nokia 9 PureView also has a 20MP front-facing camera, a 5.99-inch 1440 x 2880 screen, an in-screen fingerprint scanner, and 6GB of RAM, though its Snapdragon 845 chipset is slightly dated and its 3,320mAh battery is on the small side for a phone of this size. There’s also no headphone jack. 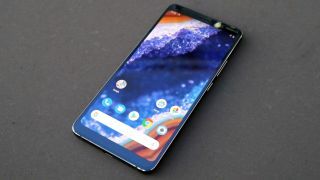 Still, you have to expect some compromises given the price, and the phone does have other things going for it, including a metal and glass build, water resistance, and the Android One version of Android 9 Pie, meaning the software isn’t just up to date, but also delivered as Google intended, and likely to get updated quickly. So there’s a lot going for it on paper, but you might want to wait for our full review before buying it, because while the Nokia 9 PureView undercuts most flagships it’s still far from cheap.